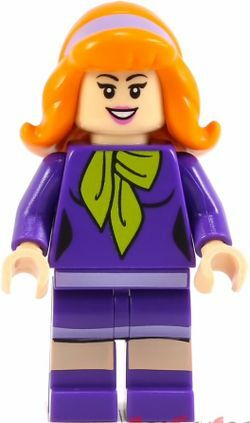 Daphne Blake is a Scooby-Doo minifigure released in 2015. She is one of the five members of "the gang", thus making her one of the main characters of the theme. Daphne has long wavy bright orange hair. Her hair has a upright fringe, and it's locks fall down past her shoulders. In her hair she wears a lavender hairband. Daphne has a light nougat head. On the front side of her head, she has curved black eyebrows over her black eyes and eyelashes. Each eye is dotted with a white pupil. She has an open mouth with her white teeth gnashing. Her mouth is outlined in bright purple lipstick. On the back of her head she has an alternative scared expression. Her mouth is in a large screaming position and there's a black gap between her sets of white teeth. Her torso is mainly medium lilac. At the top of her torso her bright yellowish green ascot is printed, on the ascot there is several black lines to represent creasings. At the bottom of her torso there's a lavender stripe. In each bottom corner of the toso she has black feminine curves. The back of her torso continues the curves and the bottom stripe. Daphne's arms are medium lilac and her hands are light nougat. To recreate her dress and boots, the top and bottom of Daphane's legs is medium lilac, the middle is light nougat. There's a lavender stripe separating the top and middle of her legs. Her leg printing continues on to the sides. Daphne Blake is the daughter of a millionaire, who created a bubble bath company called "Blake Bubble Bath". Seeking her independence and attempting to make her dream of being a detective true, she and her four best friends (Fred, Scooby-Doo, Shaggy and Velma) set out as amateur mystery solvers. Together the friends solve mysteries and foil the plans of crooks who dress up as monsters to achieve their criminal plots. During the mysteries Daphne will occasionally get captured by one of the villains such as the Zombie, she usually rescues herself and finds a clue along the way. If Daphne can't rescue herself, it's up to Scooby-Doo and Shaggy to save her. She has been given the nickname "Danger Prone Daphne" by her friends due to her clumsiness and constantly messing things up, like pressing wrong switches and getting her dress caught at ridiculous times. In doing these shenanigans she will occasionally find a clue or rescue one of her friends who is trapped or lost. Like Scooby and Shaggy she merely helps out in the trap to capture the monster and doesn't think of them. Sometimes she messes up the trap along with Shaggy and Scooby but they end up catching the monster anyway. When the monster is revealed to be a human, Daphne will give some exposition on why the person dressed up as that monster and did what they did. Daphne enjoys cooking, she usually cooks for Scooby and Shaggy and makes them sandwiches or baked goods. Daphne also likes going to beach parties, watching t.v., vacations, milkshakes, pizza, karate, clothes, looking good, going to amusement parks and dancing. Daphne dislikes monsters and her least favourite are werewolves. This is a description taken from LEGO.com. Please do not modify it. (visit this item's product page) Brave, beautiful and brainy, Daphne is the most enthusiastic member of Mystery Inc. She never leaves home without her camera and her notebook because someday she wants to be either a famous mystery writer or an investigative journalist. While she and Velma might be tied for most fearless members of the group, Daphne is definitely the most danger-prone. Unafraid to plunge forward into scary situations, it’s a good thing Daphne has a background in martial arts! Daphne is also the only minifigure in the theme besides Shaggy Rogers to appear in more then one set. Brave, beautiful and brainy, Daphne is the most enthusiastic member of Mystery Inc. She never leaves home without her camera and her notebook because someday she wants to be either a famous mystery writer or an investigative journalist. While she and Velma might be tied for most fearless members of the group, Daphne is definitely the most danger-prone. Unafraid to plunge forward into scary situations, it’s a good thing Daphne has a background in martial arts! This page was last edited on 29 June 2017, at 08:22.